Posted in Lamb, on March 28th, 2018. Uhmmm, mouth watering going on here as I look at this photo. 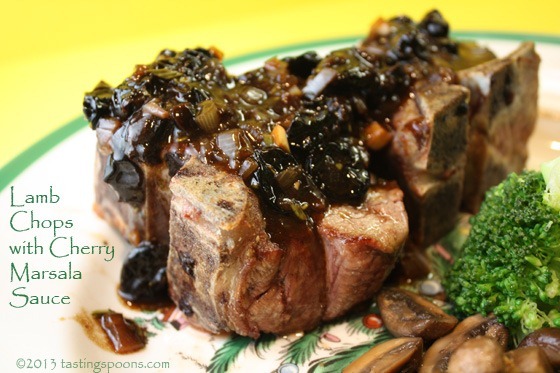 This would make a great Easter dinner entrée if you are inclined to have lamb. A few weeks ago I was at a cooking class with Tarla Fallgatter. I’ll be posting most, if not all, of her recipes from the class. Can’t wait to make some of the dishes myself. Including this one. I love lamb. I just don’t love the calorie count when I do have it. Obviously the wool-covered critters store up lots of fat amidst their meat, hence lamb, although it doesn’t look like it’s full of fat, it is! Darn. Anyway, this recipe uses a boneless leg of lamb, butterflied. That means rolling it out and cutting butterfly slices all over the meat to make it a bit more flat. 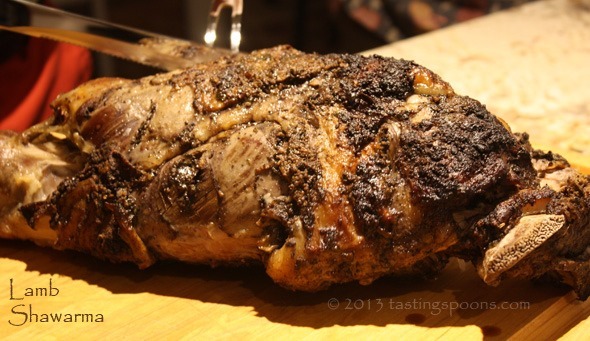 There’s a big hunk of the lamb leg that always sticks up high – – it needs to be butterflied and pounded some. If you’ve never done this before, you’ll see what I mean when you unroll that nice big boneless leg (Costco’s are a great price). Make some butterfly slices, then pound it some. You make a lovely, big batch of herbs (Italian parsley, fresh mint leaves and fresh cilantro) and mix it with garlic, smoked paprika, salt and cayenne. Some oil is added to this mixture, then you pour off 1/4 cup of it to which you add sherry vinegar and more olive oil. That part is slathered all over the outside of the rolled and tied roast – but later. Meanwhile, you use the bulk of the herb stuff to rub all over the interior part of the roast, the part that will get rolled inwards. The roast is tied well with kitchen twine, then you slather on that saved bit of herb stuff. THEN, you put it in a plastic bag and chill it for at least 8 hours, or preferably 24 hours, so those herbs just permeate everywhere. Let it sit out for an hour before roasting, though. Into a 375°F oven it goes (in a roasting pan) and bake/roast for about 1 to 1 1/4 hours, or until the interior temp reaches 125°F (rare to med-rare) or up to 135°F for medium to med-well. Personally I want it pink in the middle everywhere, so I’d be removing it at 125°F. So do start checking the temp after an hour to make sure you don’t cook it beyond your desired point. Remove from the oven and it gets tented for 20 minutes. Meanwhile, you put the roasting pan (roast has gone onto a cutting board and tented) and add wine and chicken broth to boil down a little bit. That little bit of stuff, with the pan juices gets added to the sauce that’s been kept aside. 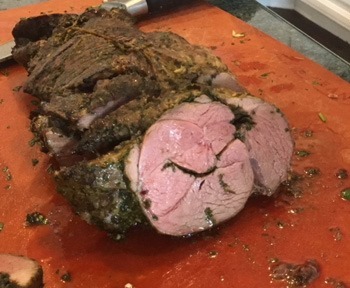 The lamb is carved into 1/2” thick slices (and then you’ll see all those beautiful swirly herbs rolled up inside). See photo. And then serve some of the herb sauce on the side, or spoon it right on top of the slice. What’s GOOD: everything about this is good. Delicious. Fantastic in my view, but then I love lamb. I love cilantro and mint too. An altogether beautiful dish, excellent for a lovely spring dinner for guests (Easter). I’d serve it with some spring vegetables (asparagus?) and a casserole full of mashed potatoes, or au gratin potatoes, or sweet potatoes. But I prefer white potatoes with this. What’s NOT: only that you need to plan ahead with this one – the roast needs to marinate for about 24 hours. 1. SAUCE: This must be made ahead as it is inserted into the raw roast and rolled, then refrigerated for 8-24 hours. Place all the sauce ingredients into a food processor (EXCEPT oil) and process until a coarse paste forms. With the machine running, add 4 T of the oil. Transfer 1/4 cup of the sauce to a bowl, add vinegar and remaining 2 T oil. Set that aside. 2. 1-2 DAYS AHEAD: Lay meat flat and pat dry with paper towels. Trim any excess fat. If there are portions that are much thicker than others, butterfly even those small sections so the whole piece if more evenly flat. 3. Lightly pound the lamb with a meat mallet (flat side), if necessary so the meat is more evenly thick. Season with salt and pepper. Spread the lamb with 3/4 of the sauce (the larger portion). Starting at the short end, roll lamb up tightly. Tie the roast well, then rub on the remaining sauce set aside earlier. Wrap roast well in plastic wrap and chill at least 8 and up to 24 hours. Let stand at room temperature for one hour before roasting. 4. Preheat oven to 375°F. Unwrap lamb and transfer to a roasting pan. Roast the lamb until an instant read thermometer inserted into the center of the meat reads 125° to 135°F depending on your choice of medium-rare to medium. This will take approximately 1 1/4 hours, but begin checking the temp earlier than that. Transfer meat to cutting board and tent with foil for about 20 minutes. 5. Meanwhile, add wine and chicken broth to the roasting pan and simmer until slightly reduced. Add the sauce that was set aside and mix. Slice lamb into 1/2″ thick slices, snipping away the twine as you go and transfer the meat to a heated platter. Add any juice from the cutting board to sauce. Serve lamb with the sauce. Per Serving: 300 Calories; 19g Fat (59.4% calories from fat); 27g Protein; 2g Carbohydrate; 1g Dietary Fiber; 73mg Cholesterol; 889mg Sodium. Posted in Lamb, on June 9th, 2016. Do you happen to have a package of ground lamb in the freezer? Here’s a quick and easy dinner if you’ve also got some zucchini and cottage cheese. Oh, did I lose you there at cottage cheese? You’ll never know, hardly, that there’s cottage cheese in the topping. I promise. 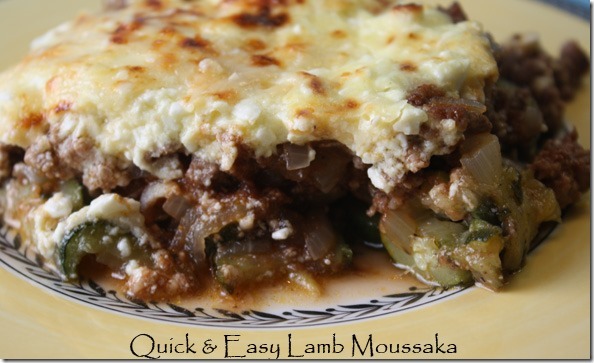 If you’ve ever had moussaka, made the long, laborious way (making a sauce and with a lamb stew kind of thing, plus eggplant), then you know the deliciousness of it (and it’s a lot of work). It’s kind of like Moussaka is to Greece as lasagna is to Italy. They’re similar, although lasagna has pasta in it. This dish has almost no carbs, just meat, vegetables and cheese and dairy. The limited carbs come from the cottage cheese (some), the yogurt or sour cream (some) and the tomato sauce (which is pure carbs because tomatoes are a fruit), though there’s only an 8-ounce can of the sauce in the whole casserole. The other day I was looking up a recipe I did for my blog when it was brand-spanking new in 2007. And I started off the first paragraph talking about the dish being a casserole. And then (9 years ago) I swear the word casserole, in food circles, was an anathema. As if it was something bad that only your ancient great grandmother would make. I’m glad to see that casseroles are making a comeback – in fact I bought a cookbook a few years ago all about new-fangled casseroles. 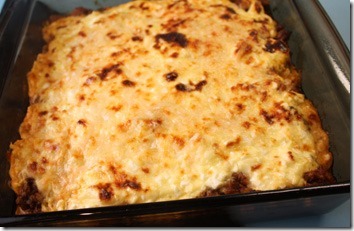 This casserole is a revision of a recipe I posted here, years ago also – Easy Ground Beef Moussaka. It’s a winner of a quick recipe, and one that I’ve made dozens of times over the years. You briefly cook the zucchini and put it in the bottom of a 9×9 baking dish, then you cook meat with onion, garlic and spices, then add in some canned tomato sauce. That goes on top of the zucchini. 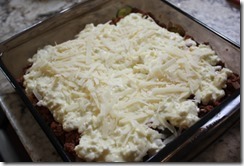 Then you make the super-easy topping (cottage cheese, yogurt or sour cream, egg, Feta, and Parmesan) and it’s spread on top with another sprinkling of Parm on the very top. So THIS RECIPE, I just revised it a bit by using ground LAMB. The zucchini is the same (see picture above), the filling is the same (although I added in some different herbs and spices – I added some dried mint to the meat mixture which is different) and the topping is identical (see the uncooked dish at right). I should have invited somebody to come for dinner, because it made plenty for about 5 people, I think. A salad on the side and maybe some bread is all you’d need for a complete meal. I didn’t make a salad or have bread – the serving of this dish was ample for my dinner. There at left is the dish just out of the oven. I actually turned on the broiler element for about 3 minutes to get those nice crusty bits on top. 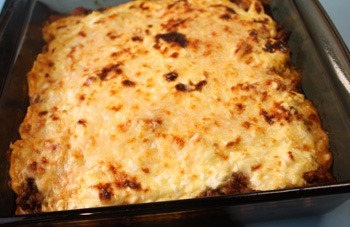 But the topping is all composed of dairy and a little bit of cheese, so you don’t want to overdo the broiling. The dish comes together in about 30 minutes, I guess, maybe a little bit more, and it bakes for 30 minutes, so you could have it on the table in about an hour. The lamb I had was not very lamb-y tasting. Why is that? I think it was Colorado lamb, not New Zealand. I don’t know if there is a difference. But the casserole was just wonderful anyway. Maybe it’s because I grew up on casseroles. My mother used to make them frequently. The original recipe for this came from one of my mother and dad’s friends, so it’s a old-old recipe. What’s GOOD: well, I like casseroles to begin with. This is an easy one-baking-pan dish, though you will dirty up a couple of pans doing the prep for this. I love the combo of the ground meat layer, the zucchini and then the Feta-salty-creamy topping with the melted Parmesan on top. It’s comfort food, I’m sure. And I liked this one made with lamb rather than ground beef. What’s NOT: if you don’t like lamb, well, you won’t like this. Most people like Feta. And I promise, even if you’re a cottage cheese hater, I doubt you’d notice. You can barely see the curds of cottage cheese in the topping, but it’s blended in with crumbles of Feta and you could easily think that’s what you were eating. 2. In a large skillet heat the olive oil, then add the finely chopped onion. Simmer for 4-6 minutes until the onion is wilted. Add the garlic and stir for about a minute. Scoop the onion mixture out and set aside. 3. To the same skillet add the ground lamb (usually there is sufficient fat – add a jot of oil if it’s particularly lean) and break up as it cooks through. Spoon out any fat and discard. When all the pink is gone, add the onion mixture back in, then the seasonings, tomato sauce and red wine. Bring to a boil, reduce heat and simmer for about 10 minutes. Stir in salt and pepper to taste. 4. Meanwhile, in another skillet, heat olive oil. 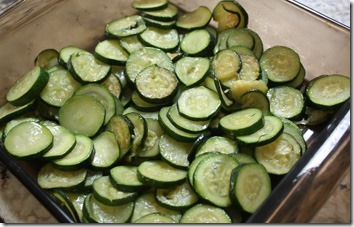 If the zucchini is really large, cut each one in half lengthwise and then slice. Add to skillet and cook over medium heat until the zucchini has taken on some golden color, stirring occasionally. Do not cook the zucchini through as it will cook further during the baking. 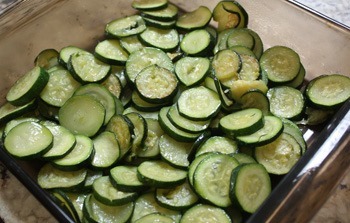 When it’s cooked enough, pour the zucchini into 9×9 square baking dish (ceramic or glass). 5. Pour the lamb mixture over the top of the zucchini and spread out, completely covering the zucchini. 6. In a medium bowl combine the cottage cheese, yogurt, Feta, egg and one portion of the grated cheese. Stir vigorously until the egg has completely disappeared in the mixture. Carefully pour this mixture over the meat mixture, trying to get it all the way to the edges – but without picking up any of the meat. Use an offset spatula if you have one. 7. 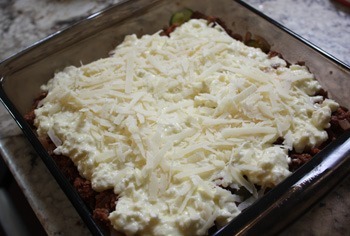 Sprinkle the remaining cheese on top and bake for 30 minutes, or until the top of the dish is golden brown. You may use a broiler at the last if you’d prefer, but watch it carefully as it will burn quickly. 8. Allow to cool at least 5 minutes, then serve portions, trying to keep the square portion intact. 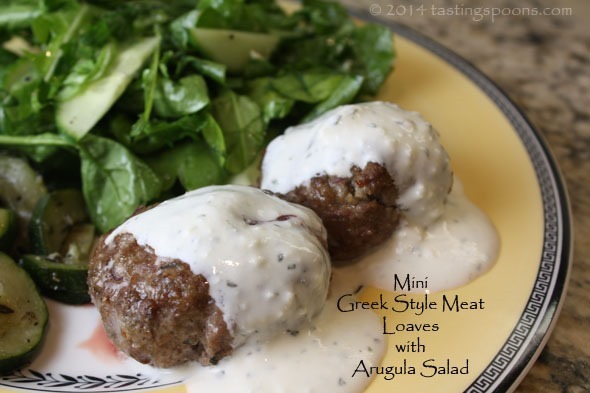 Serve with a green salad and bread on the side. 9. As it sits, the zucchini lets loose of some of its water, so If you have leftovers, try to drain off that liquid so the casserole isn’t water-logged. Reheat in a low oven for about 20 minutes, or heat individual servings in the microwave, but cover it as it will spatter. Per Serving: 314 Calories; 23g Fat (65.8% calories from fat); 18g Protein; 9g Carbohydrate; 2g Dietary Fiber; 77mg Cholesterol; 533mg Sodium. Posted in Lamb, on May 24th, 2015. My daughter in law, Karen, is a wonderful cook. More than once my DH and I have been at their home and she served these delicious lamb shanks. Last time she made it was a few weeks ago and I just couldn’t eat it because of my food poisoning (sorry to keep bringing that up, but it really did disrupt my eating style, big time, though I’m fully recovered now), but I did eat some of the gravy and rice she’d served alongside. It tasted wonderful, and she mentioned where the recipe had come from, so I made this myself. Whenever I go researching for a recipe, I rarely, if ever go to the Joy of Cooking. In years past, I used to, because that was kind of the cookbook bible I had in my younger years, when I owned 10 cookbooks total. But now, I’ve got umpteen hundred cookbooks and I either search online, or I go to my recipe program and look at what recipes I’ve stored in my to-try file (it’s called Internet Recipes there). So, for whatever reason, as I was beginning to eat regular food again, this lamb recipe kept coming up in my head. I figured that it meant I really should make it (the dr. said don’t eat something unless you actually crave it). And I know that a lamb and rice diet is something lots of veterinarians say is easily digestible. So, I bought the ingredients and I made it. Karen calls this Moroccan Lamb Shanks, but that’s not what the recipe is called in the cookbook, Joy of Cooking . It’s called Braised Lamb Shanks, but it contains a variety of mild Moroccan spices (cinnamon, allspice, cumin, coriander and harissa). And the recipe calls for carrots and winter squash. I decided not to add the winter squash to it, just because, but I used rainbow carrots, and I added celery, which wasn’t in the recipe. And it made a marvelous gravy – according to the recipe, the collagen in the bones helps thicken the braising liquid (chicken stock and white wine), and it does. Not a lot, but it makes a slightly thickened sauce that’s perfect over rice or mashed potatoes, which is what sounded good to me. In the Joy cookbook, Rombauer has you bake the lamb shanks for 1 1/2 hours at 300°. I took the lazy woman’s approach and did the whole thing in my small slow cooker (actually it’s my risotto cooker that has a slow cooker function). 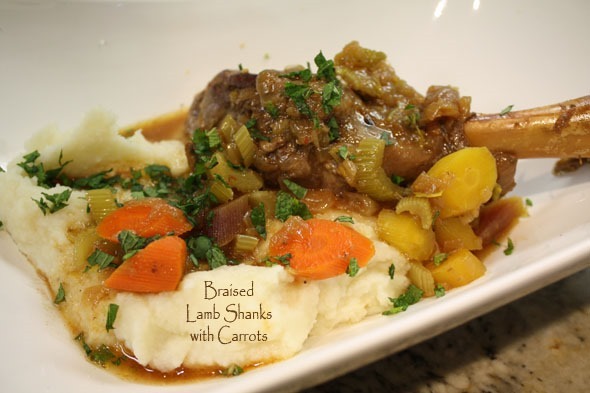 It was perfect for making 2 lamb shanks, which was more than enough for me for 2-3 meals. So, in the recipe below, I’ve included a paragraph at the bottom with the instructions for making it in the slow cooker. The prep work really took very little time – I browned the lamb shanks for awhile, removed them, sautéed the thinly sliced onions, added in the garlic at the last (I used ample) and the spices. Then you add the liquids, some tomato paste, heat that up, then add back in the lamb shanks. I set it to cook on the slow setting for about 6 hours. Twice I picked up the lid and turned the lamb shanks over, because they weren’t submerged in liquid, only up about halfway. Then I added the carrots and celery, and let that cook for about 45 minutes to an hour and it was ready to serve. At the very last you add in some fresh lemon juice, some harissa and the final dish is sprinkled with freshly chopped mint. Done. And it was every bit as good as I remembered. The gravy is a lovely medium-brown color and drizzles well over whatever carbs you might want to serve with this. As for the lamb shanks, I happened to go to Sprouts to buy my ingredients (I don’t often shop there, but I figured they’d have lamb shanks) and sure-enough, they had some grass fed lamb shanks. They were on the smaller side, but perfect for me. 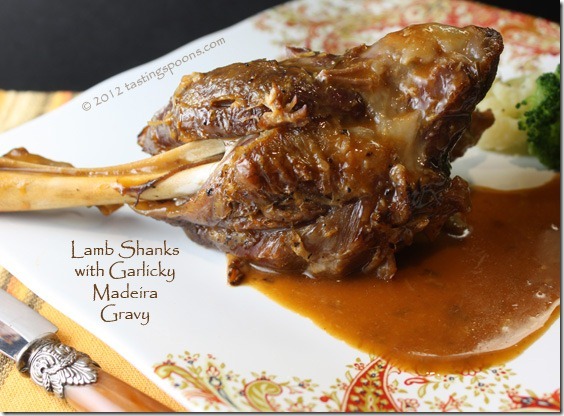 Lamb shanks aren’t cheap food anymore – each small one was about $4.00. If you’re feeding hungry teenagers they’d have wanted 2 of these smaller ones. But with lots of veggies and carbs to go with it, you might be able to get away with just one per hungry person. What’s GOOD: several things: (1) the flavoring/gravy is divine; (2) I did it in a slow cooker, so it was super-easy; (3) it’s good enough to serve to guests, even. Good enough reasons to try it? I’ll be making this again. What’s NOT: really nothing at all – if you don’t want to use a slow cooker, just bake in the oven for 1 1/2 hours; otherwise, set this for 6 hours and then add the veggies and plan for another hour and it’s ready to serve. 1. Preheat the oven to 300°F. Trim most of the external fat from: lamb shanks. Season with salt and pepper. 2. Heat olive oil in large Dutch oven over high heat. Add shanks and brown on all sides, about 5 minutes. Remove the shanks and keep warm. Pour off the fat, then add additional olive oil, onions and garlic (at the last, so it doesn’t burn). 3. Reduce heat to medium, cover and cook, stirring often, until the onions are quite soft, then sprinkle with all the spices. Stir to coat the onions, then add stock, white wine and tomato puree. 4. Increase the heat and bring to a boil. Return lamb shanks to the pan, cover and bake until the meat is almost falling off the bone, 1-1 1/2 hours. 5. Add carrots and winter squash. Cover and bake until the vegetables are tender, about 15 minutes more. 6. Remove the meat and vegetables to a platter and cover with aluminum foil to keep warm. Skim off the fat from the surface of the sauce. Add lemon juice, mint and harissa. (The collagen in the bones should produce a velvety slightly thick sauce. If it’s not thick enough, you can reduce it further, but don’t season any further until you’ve done that.) Taste and adjust seasonings. Pour the sauce over the meat and vegetables. Serve with orzo, rice pilaf, braised lentils or white beans. [I served it with mashed potatoes in order to enjoy more of the flavorful sauce.] SLOW COOKER: Brown lamb shanks, remove, then add onions. Cook for 4-5 minutes until softened, then add garlic for about a minute. Add seasonings, then chicken broth and all the spices and tomato paste. Stir well. Bring mixture to a boil, add lamb shanks and place in slow cooker for about 6 hours on low. Add carrots (and celery, if using) and cook another hour or so until carrots are just fork tender. Add lemon juice, harissa and sprinkle with mint when serving. Per Serving: 268 Calories; 14g Fat (54.2% calories from fat); 4g Protein; 23g Carbohydrate; 5g Dietary Fiber; 0mg Cholesterol; 1722mg Sodium. Posted in Beef, Lamb, on September 12th, 2014. Dinner needed in a hurry? This is a great make-ahead meal that requires very little time in the oven. The salad with cucumber provides some vegetables and the Greek tzasiki-type sauce on the meat just makes it perfect. A couple of weeks ago I spent the weekend with daughter Sara and her family. And Sara wanted to spend part of Sunday doing some make-ahead meals for her family. Both of the kids are in sports, so weeknight mealtimes have to be jammed into what little time Sara can carve out of the late afternoon or evening. Sabrina drives herself mostly, but John the younger sibling is just 13, so he must be delivered and picked up and often John Sr. stays and watches his practices. Anyway, this is one of the meals we put together and Sara was kind enough to give me a portion so I could make it once I got home. I baked mine in 2 ramekins (just easier for my single portion). The recipe came from Cooking Light. Since making this Sara and I both agreed on a couple of things: (1) we would switch the amount of lamb and beef – we both wanted a more lamb flavor; (2) the baking time was not enough. So the recipe below has been changed. We also used full fat yogurt, but you don’t have to. We also thought that if the meat loaf was just slightly bigger, we could have eaten just one, so if I did this again, I’d do just that – I’d mound the meat loaves in the muffin tin or ramekin. You’d need to up the baking time if you did that. Lamb is rich, so halving the 2-meat loaf portion would cut down the calories significantly. The original recipe called for 10 ounces of beef and 5 ounces of lamb. That’s been switched, just so you know. The sauce was easy enough to make – it’s the standard kinds of ingredients for tzasiki sauce and was made ahead. 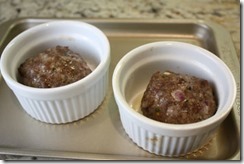 On the recipe below I’ve also included instructions for freezing the meat – make them into mounds that will fit in a muffin tin or ramekin, place on a parchment or plastic wrap lined baking sheet and freeze, then package them for longer freezer storage. If you added vegetables to the salad (it already has cucumber in it, but you could add bell pepper, for instance) you’d have a complete meal with the meat loaves, sauce and the salad. What’s GOOD: these were tasty. Not necessarily off the charts, but not every meal can be that way, anyway. I would like them better next time with more lamb, hence the change in the recipe below. They were certainly easy to make and very quick for a weeknight dinner – providing the meat loaves were defrosted. The sauce is really good – don’t skimp on that part as I think it makes the dish. What’s NOT: nothing, really. Altogether a good dish and easy. NOTES: If you want to make these ahead to freeze, form into shapes that will fit into a muffin tin or ramekins, place on a plastic-wrap lined baking sheet & freeze solid. Then package and seal for longer-term storage. Sauce cannot be frozen. Each serving is 2 of these patties. 2. MEAT: Combine first 4 ingredients in a large bowl. Stir in 1 tablespoon mint, 1 tablespoon thyme, 1/4 teaspoon salt, allspice, and next 3 ingredients (through egg). 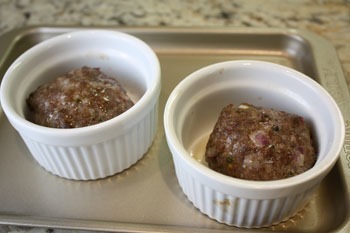 Press meat mixture into 8 muffin cups coated with cooking spray. (if you have more empty muffin cups, fill that half full with water during the baking.) Bake at 450° for 8-9 minutes. Turn broiler to high; broil 3 minutes. If top isn’t starting to brown, continue on broil for another minute. If using an instant-read thermometer, bake until the center of the meat loaf is about 160°-165°F which will still be just past pink in the middle. Cook longer if you prefer it more well done. 3. SAUCE: Combine yogurt, feta, 1 tablespoon juice, 1 teaspoon mint, and 1 teaspoon thyme in a mini food processor; pulse 10 times to combine. 4. SALAD: Combine 1 tablespoon juice, olive oil, 1/8 teaspoon salt, and pepper in a bowl; stir. Add arugula and cucumber; toss. Per Serving: 463 Calories; 34g Fat (66.4% calories from fat); 26g Protein; 12g Carbohydrate; 1g Dietary Fiber; 147mg Cholesterol; 534mg Sodium. Posted in Lamb, Soups, on October 23rd, 2013. After roasting, grilling or braising a leg of lamb, I never seem to know what to do with the leftovers. One night we had the lamb shawarma in a sandwich (flatbread) as we’d prepared it for the dinner for 8 we did. But I still had about a pound of meat remaining. What to do. Aha! Soup. Going to Eat Your Books, I quickly found a recipe in my copy of James Peterson’s soup book, Splendid Soups: Recipes and Master Techniques for Making the World’s Best Soups . Peterson, indeed, makes some splendid soups in this book. None of them 2-3 ingredients, however. But I like that. I used his recipe as my inspiration. A few ingredients I didn’t have, so I just punted. I changed a bit the way it was made because I believe that the vegetables you put into the beginning of a soup give out and off all the flavor and texture they have to the broth. And rather than starting with fresh meat (like shanks or stew meat) I wanted to use the leg of lamb bones (that did have a bit of meat attached, but I’d cut off most of the meat – it was added in at the end of the soup making, since it was all cooked). And I prefer soups with more than just beans or lentils – I want more veggies. So I threw out all those soft and mushy veggies used to flavor the broth and added new ones (onions, carrots and celery). It called for fresh ginger in the beginning too. And some saffron, cinnamon and turmeric. I added curry powder also. I’d saved the broth and drippings from the roasting pan when I made the lamb shawarma, so that went into the pot as well. The shawarma seasonings were somewhat similar to this soup, so I thought they added just a bit more oomph to the flavor. What I had were tiny yellow lentils, so they went in after the broth was created, but after I’d strained out everything from the broth itself (the bones, ginger chunks, onions, celery, etc.) so it was just flavorful broth at that point. I added beef broth (using my Penzey’s soup base. Then after the lentils were done I added a CAN of chickpeas (drained and rinsed) and new vegetables. I also added a can of chopped tomatoes including the juices. That simmered for a short time, then I added the lamb, all cut up into cubes and some parsley. Full-fat (Greek) yogurt was added. My pot was simmering a bit too vigorously if you examine the photo carefully – so it separated some. It didn’t look very pretty, so I added 1/4 cup of heavy cream to it. Hardly made much of a difference in the consistency, actually. It probably needed more, but that’s all I was willing to add. And it was done. All I did was garnish it and serve in wide bowls along with some home made no-knead wheat/rye bread I’d made, nicely slathered with unsalted butter. Yum. What’s GOOD: first, it was a good way to use up all that leftover leg of lamb meat. I was happy to have a good use for it. AND, I’m glad I now have a great recipe I can return to in the future! I don’t much like just pieces of leftover lamb heated up as a dinner entrée. The soup freezes well too. I now have 2 ziploc bags (2 servings each) in the freezer for some night when I don’t feel like cooking! What’s NOT: only the time you have to commit to the long, slow cooking – at least a couple of hours, but it happily simmered away while I did other things in between times. Note: this soup can be made in a slow cooker; it just will take longer. Add the lentils about an hour before the soup is done along with the new vegetables. 1. In a 6-quart pot, lightly brown the lamb bones in butter. Remove lamb from pot. If the butter has burned, pour it out and replace it with fresh butter. Add the onions, carrots and celery. Stir over medium heat for about 5 minutes and then add turmeric, ginger, cinnamon, curry powder and saffron. Stir for 5 minutes more. 2. Add broth. Cover the pot and simmer gently for an hour. Remove the lamb bones and strain mixture to remove all vegetables, debris and foam. Wash the pot and pour the strained mixture back into the soup pot. Add the new vegetables (onions, celery and carrots), lentils and tomatoes and simmer for about 20 minutes, or until the lentils and vegetables are just cooked through. 3. Add the canned garbanzo beans and the left over lamb meat. Bring to a boil and simmer for 5 minutes. Stir parsley, cilantro and yogurt into soup. Season soup with salt and pepper to taste. Ladle into soup bowls, sprinkle with more cilantro. Per Serving: 600 Calories; 33g Fat (45.8% calories from fat); 41g Protein; 46g Carbohydrate; 14g Dietary Fiber; 100mg Cholesterol; 583mg Sodium. Posted in Lamb, on October 19th, 2013. That’s a huge leg of lamb (8 1/2 pounds to be exact) we made for our Israeli dinner recently. The darkened patches are the spices that were used in the marinade. It’s oven baked. Since it’s not roasted on one of those unique vertical spits, it’s not an authentic Shawarma, but it’s close enough for government work, as they say. I suppose I should call it Shawarma for the home kitchen. As I just mentioned a few days ago, my DH loves-loves lamb, and would happily eat it about once a week if I’d prepare it. But lamb is a very saturated fat – and I don’t just mean because it’s a red meat – I mean that lamb in and of itself is a very fatty meat, comparing it with beef or pork. It’s hard to realize it unless you read the nutrition info on lamb recipes, or even when you look at those cute little lamb chops in the grocery store, or at the slices of lamb cut from the above leg. Even when I cut up the meat from this meal later (as leftovers) I could hardly SEE any fat in it. But it’s there. Hence I buy leg of lamb very rarely. And not only because of the high fat, but also because I never seem to be very happy using up the leftovers. 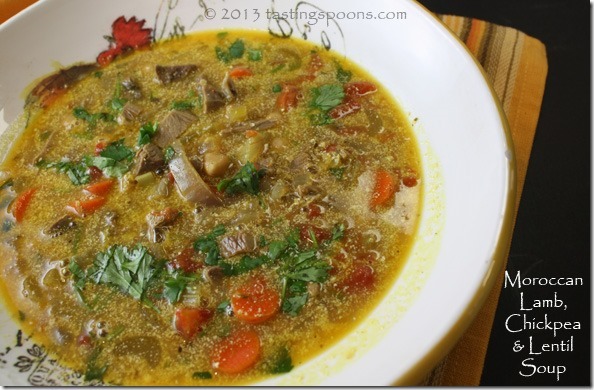 But oh, this time, I’ve got a winner of a recipe to share – in a day or two – a soup I made with the bones and lamb meat. The recipe for this came from Jerusalem: A Cookbook . The authors provide lots of details about the origins of the spice mixture ((Lebanese) and about ways to serve the lamb. Aren’t the colors beautiful? Seeing this plate reminds me of our trip some years ago to Turkey (in 1997). We visited an underground ancient city in Cappadocia that provided a safe haven for Christians when the Romans were trying to arrest and kill them all. The Christians lived and hid there for months, some for years. There was even a morgue that could be sealed up with a stone (because of the smell, I suppose) because no one could go above ground during that time. Considering this was about 2000 years ago, they had a very sophisticated ventilation system too, so they wouldn’t be found from any little twists of smoke emanating through the rocks hiding the entrance at ground level. 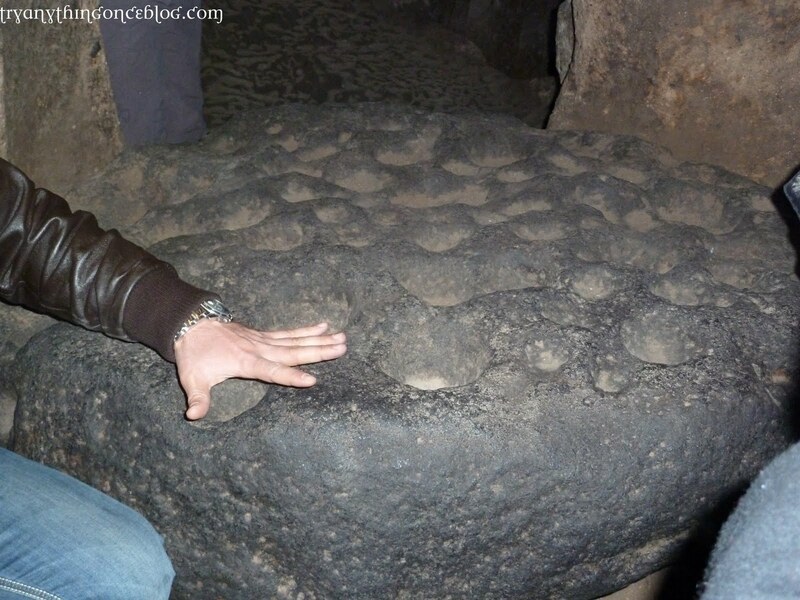 In one of the subterranean rooms was a kitchen and a big stone sat right in the middle of this room – the top was flat with a myriad of little 2-4 inch round indentations. It was their kitchen spice cabinet, so to speak. When the underground caverns were discovered centuries later, there were still remnants of the herbs and spices in the little cups. At left you can see an example of one (from tryanythingonce blog). Those cups would have held all of the spices you see on the plate above. At right is a photo from the underground caverns (from the vagablond.com). The cavern we visited went down something like 8 stories below ground. It was an ever-winding spiral, down, down, down. Only the top 3 “floors” closest to the surface were open to the public and some of the connecting tunnels were very narrow and low. My DH, who is tall, got stuck in one of them as he bent over trying to move forward, and had to be pushed slightly from behind to get through the passage. Scary for him, as he gets claustrophobic. The picture here shows very wide and tall tunnels. Not so in the one we visited! overnight. Most of the marinade stuck well to the lamb, so once it went into a baking pan (on a rack, my turkey roaster actually) it was easy to go right into the oven. 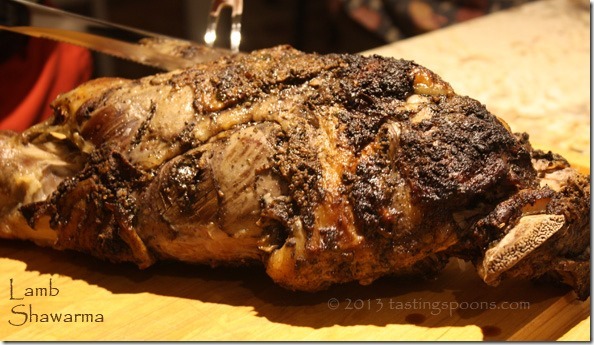 The lamb was roasted at a low temp for about 5 hours (part of the time covered with foil). 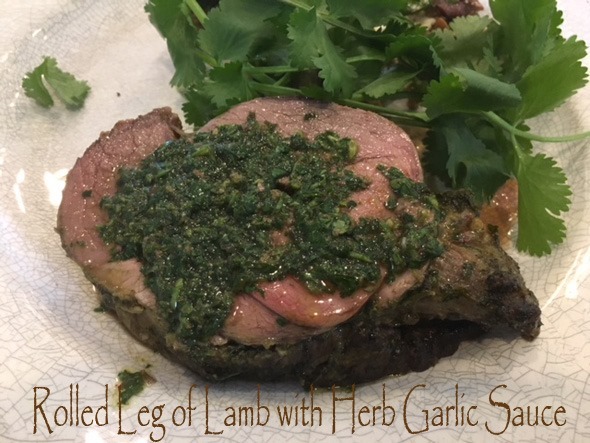 I allowed a little extra time because the lamb leg was bigger than the recipe indicated. The meat wasn’t falling off the bone, really, as some commenters mentioned on other sites where I found the recipe online, but it was quite tender. Traditionally this dish is served in either pita bread or some kind of soft foldable flatbread with condiments like chopped tomato, chopped cucumber, onions and definitely some sumac to sprinkle on top. I did the same. We had fresh sangak bread on hand and I tore it up into hand-sized portions and placed the slices of lamb on the bread. The tray was passed at the table for people to add condiments of their choice. The recipe also mentioned a spread to put on the bread or pita – a mixture of canned tomatoes, harissa, tomato paste, olive oil, salt and pepper. So I spread some of that on each piece of sangak bread as it was served. The harissa added some heat – everyone noticed that. I liked it, actually. The only thing missing in my book was some fresh Greek yogurt to dab on the hand-sandwich. The recipe didn’t indicate it, so I didn’t put it out, but I think it would have been a nice addition. What’s GOOD: loved the spices in this – warm and cozy. The lamb was not difficult, but was a bit time consuming and I needed to be near the oven periodically over the 5 hours to keep water in the pan below the meat (so it wouldn’t dry out). It made a gorgeous presentation. Meat was well done, obviously. Not dry, though and was still relatively tender. Made a very spectacular centerpiece of a meal. What’s NOT: it’s a fair amount of work, as I mentioned above. 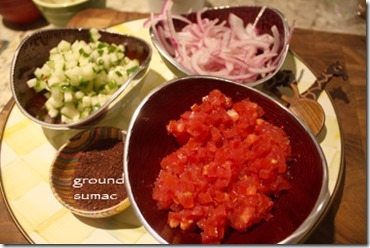 If you have an Alligator 11-1/4-Inch Dicer with Collector , it’s quick work to make the condiments you see above. If you don’t own all the spices already, it could be a bit expensive to buy them all. 1. Put the first 8 ingredients in a cast-iron pan and dry-roast on medium-high heat for a minute or two, until the spices begin to pop and release their aromas. Take care not to burn them. 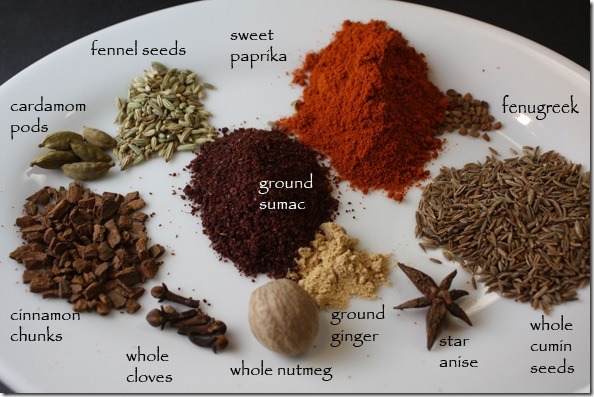 Add the nutmeg, ginger, and paprika, toss for a few more seconds, just to heat them, then transfer to a spice grinder. Process the spices to a uniform powder. Transfer to a medium bowl and stir in all the remaining ingredients, apart from the lamb. 2. Use a small sharp knife to score the leg of lamb in a few places, making 2/3-inch-deep slits through the fat and meat to allow the marinade to seep in. Place in a large roasting tin and rub the marinade all over the lamb; use your hands to massage the meat well. Cover the tin with foil and leave aside for at least a couple of hours or, preferably, chill overnight. 3. Preheat the oven to 325°F. Put the lamb in the oven with its fatty side facing up and roast for a total of about 41/2 hours, until the meat is completely tender. After 30 minutes of roasting add about a cup of boiling water to the pan and use this liquid to baste the meat every hour or so. Add more water, as needed, making sure there is always a little in the bottom of the pan. For the last 3 hours, cover the lamb with foil to prevent the spices from burning. 4. Once done, remove the lamb from the oven and let rest for 10 minutes before carving and serving. Per Serving: 756 Calories; 59g Fat (69.9% calories from fat); 46g Protein; 11g Carbohydrate; 4g Dietary Fiber; 170mg Cholesterol; 856mg Sodium. Posted in Lamb, on October 13th, 2013. The cooking class I went to recently was all about SAUCES. We had 4 sauces altogether: two on meats (pork tenderloin and this lamb), one on a chicken breast, another on salmon, plus a chocolate caramel sauce on a dessert. And none of them was ordinary. They all started from some basic sauce, but each had something unique or different about them. That’s why I took the class! Do you ever eyeball those lovely lamb racks at Costco? Or the frozen ones at Trader Joe’s? They’re pricey, no question, but for a special occasion, I’ll splurge and get one. 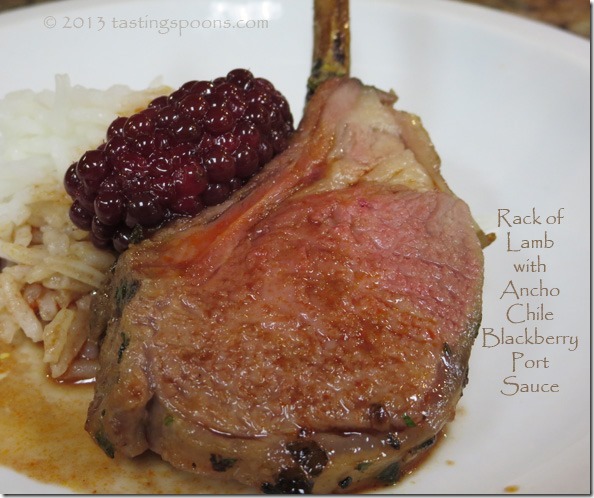 My DH really loves rack of lamb and I don’t fix it anywhere near often enough for him! Maybe twice a year. I think the ones from TJ’s already have a rub or herbs on them – you won’t want to buy that as this recipe has a light flavoring to put on it as well. But this recipe is all about the sauce. Ancho chiles are a favorite of mine because they are mild. They impart lots of flavor, but not much heat. Now occasionally you may find one with some heat, but usually not. Anchos are dried poblano chiles, same thing. At left you can see the dried anchos (thanks to photo at Freida’s Produce). At right is a photo of a fresh poblano. We can buy them fresh at almost any grocery store here in California. The lamb is rubbed with a mixture and allowed to sit out at room temp for about 45 minutes; otherwise, make it several hours ahead and just put it in the refrigerator until 30 minutes or so before you’re ready to bake. The lamb is browned well on as many sides as you can manage (they’re a bit awkward to brown, I admit), then place them on a parchment lined baking sheet and roast for about 15-20 minutes. They also need to rest for 5-8 minutes afterwards to let all the juices re-absorb before you cut them into little ribs and serve. Meanwhile, you make the sauce. Have everything all ready to go – once you start the lamb browning and baking, you’ll want to be on a time line. Have your meal all ready (except plating) and do serve this with some kind of carb so you can soak up any errant sauce. You’ll want to get every bit of it! Anyway, the ancho chiles need to be soaked (do this ahead), then they’re whizzed up in the food processor with some of the soaking liquid. It makes a puree that gets added to the sauce later on. The usual flavor mixture starts with celery, carrots and onion, then peppercorns, port wine, red wine, cranberry juice concentrate (great flavor), the ancho puree, some brown sugar and chicken broth. You boil it until it’s reduced by half, then you season it and add fresh blackberries. At the very last minute you add a couple T. of unsalted butter and season it if needed. Serve with that carb, and garnish with at least one pretty blackberry. This makes a fairly thin sauce – if you want something thicker, remove a bit of the liquid, cool and add some flour. Do this after you’ve reduced the liquid by half. What’s GOOD: Well, the sauce first and foremost. It has wonderful flavor. If you enjoy lamb, this will be a fabulous meal. What’s NOT: the sauce does take a bit of time to make – this would be a special occasion kind of meal. 1. LAMB PREP: Unwrap lamb and pat dry with paper towels. Combine the garlic, cilantro and oil, mixing to form a paste. Rub all over the lamb and let stand at room temp for 45 minutes, or cover and refrigerate for 3-4 hours. 2. ANCHO SAUCE: Combine the ancho chiles and water in a small bowl and let stand 1 hour. Drain well, reserving the soaking liquid. Remove the seeds and stems and puree in a food processor with the garlic and about 1/2 cup of the liquid, or more if needed. 3. PORT SAUCE: Melt HALF the butter in a medium non-reactive saucepan over medium heat. Cook the celery, carrot, and onions until soft. Add the peppercorns, port, red wine, cranberry juice concentrate, ancho puree, brown sugar, and stock and cook over high heat, stirring occasionally, until reduced by half. Strain into a clean pot, add the blackberries, and cook over medium heat until the blackberries are warmed through. You may crush them with the back of a fork if preferred. Season with salt, to taste. Add the remaining butter in little pieces and allow it to melt without bringing it to a boil. The sauce is on the thin side – if you prefer a thicker sauce, remove a little bit of the sauce after you’ve reduced it by half, allow it to cool and shake it up in a sealed jar with about a T. of flour. Add into the sauce and cook for 3-5 minutes before finishing with the butter. 4. LAMB ROASTING: Preheat oven to 425°F on convection/bake if it’s available. Heat a large skillet over medium-high heat. Season the lamb racks with salt and pepper and brown them on all sides, fatty side first. Transfer lamb to a parchment-lined baking sheet and roast for 15-20 minutes or until the internal temperature reaches 120°F. If you prefer it medium, cook it until it reaches 125°-130°. Remove pan from oven and tent with foil, allowing it to rest for 5-8 minutes before cutting the chops individually and serving onto hot plates with a fresh blackberry for each serving. Do serve with a carb (rice, mashed potatoes, polenta or pasta) to soak up the sauce. Per Serving: 735 Calories; 55g Fat (72.9% calories from fat); 23g Protein; 23g Carbohydrate; 4g Dietary Fiber; 116mg Cholesterol; 1197mg Sodium. Posted in Lamb, Pasta, on May 27th, 2013. I’ve re-named this dish slightly from the original recipe over at Food52. I didn’t have orzo pasta for one thing, and I thought describing it as a Ragu might give you a better idea of what it is. And you just need to know that this is fabulous. Absolutely drop-dead fantastic. If you enjoy lamb (ground), and pasta, with Feta, lemon and Kalamata olives, well this is right up your alley. You’ve heard it here before, that when I see other bloggers use superlatives when they describe a dish, I pay attention. Not only did the originator, Emily at fiveandspice wax glorious about it, but Amanda & Merrill at Food52 did too. That was enough for me to decide to make it. What clinched it was seeing a package of ground lamb at the market and that was that. The original called for fresh spinach. Well, I had arugula instead, but I doubt that would have made much of a taste difference. And, as I mentioned above, I used different pasta (farfalline instead of orzo). The original title is “Greek” Lamb with Orzo. The Greek part is all the Greek-style additions: Feta, olives, lemon juice, oregano, but otherwise it’s an Italian style ragu. The back story of the recipe is just the kind of history I love. The recipe came from Emily’s mother, from a magazine, and it was a family favorite. Here’s what she said: It was also the recipe she sent to each of us [kids], successively, when we needed something easy but impressive to cook for friends in college. It’s still one of my favorite meals, and a wonderful way to easily serve a crowd. Of course, as I’ve evolved, my lamb with orzo has evolved as well, gathering additional ingredients and spices like a glacier gathering stones. . . . I loved that last phrase Emily wrote – gathering ingredients and spices like a glacier gathering stones. I think Emily needs to be a writer . . . The sauce is relatively easy to make – lamb browned, most of the fat drained, onions and garlic added, then tomatoes, seasonings (including some cinnamon and ground coriander, which are different). The pasta is made and tossed with some oil and lemon juice. 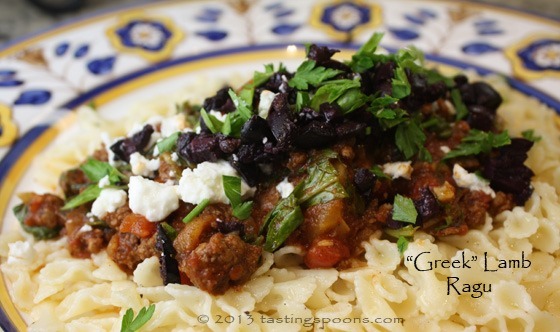 When you spoon the ragu on top of the pasta you garnish with Feta cheese crumbles and Kalamata olives. Done. Serve. What’s GOOD: I refused to put down my spoon until every single morsel was slicked off the plate. Does that tell you how good it was? The other great thing? One pound of lamb makes enough sauce to serve 8, supposedly. Hungry eaters? Well, maybe 6 then, but it’s very filling and comforting food. A definite make-again dish. My DH thought it was fabulous too. It’s going onto my Carolyn’s Favs list, in case that is any additional motivation for you to make this! What’s NOT: nothing, other than you will dirty up a fair number of dishes, pots and pans in the making of it. Worth it, but then I don’t wash the dishes, my darling DH does. He did complain a bit. Note: If you have hungry young people, maybe you’ll use all the pasta – I think 3/4 pound of pasta is sufficient for the volume of sauce. I also used more Feta than indicated. 1. In a good sized Dutch oven or other heavy bottomed pan, heat the one tablespoon of olive oil over medium-high heat until it is shimmering. Add the lamb and sprinkle with 1/2 teaspoon of salt and a good grinding of black pepper. Cook, stirring to break it apart, until it is nicely browned. Remove the lamb with a slotted spoon and drain all but 2 tablespoons of the fat. 2. Return the pot to the stove top and add the onion and garlic (still over medium-high). Cook, stirring occasionally, until they are softened and golden, about 5 minutes. Stir in the spices (cinnamon, oregano, cumin, coriander, and red pepper) and cook until they start smelling extremely toasty and fragrant (1-2 minutes). Then, stir in the smooshed tomatoes. 3. Cook the smooshed tomatoes in the spices, stirring occasionally, for 10 minutes. Then, add the can of diced tomatoes and 2 cups of water. Bring to a boil, then turn down to a simmer and simmer, uncovered, for 15 minutes. 4. Add the cooked lamb back to the pot, give a good stir, then cover the pot and leave it to cook, stirring from time to time, for 20 minutes. At this point, stir in the fresh spinach and cook just a couple more minutes until the spinach is wilted. Taste and add salt and pepper to taste (keeping in mind you’ll be sprinkling just a touch of feta and olives on, which will add to the saltiness). 5. While the lamb and tomatoes are simmering together and marrying their flavors, bring a large pot of well-salted water (it should taste like sea water, basically) to a boil. Add the orzo and cook until al dente, about 7 or 8 minutes, usually. Reserve 1/2 cup of pasta water. 6. Drain the orzo. Toss the orzo with the 2 tablespoons of olive oil, the lemon juice, and all of the parsley, adding a bit of pasta water at a time, if you feel it needs additional liquid. 7. Spread the orzo out on an enormous serving platter. Spoon the lamb and sauce all over the top, then sprinkle with the feta and chopped olives. Pass the dish around the table and relax. A good red wine, on the dry side, is a highly recommended companion here. Per Serving (you do pour off excess fat, so this is a bit high): 513 Calories; 24g Fat (41.7% calories from fat); 21g Protein; 55g Carbohydrate; 5g Dietary Fiber; 50mg Cholesterol; 366mg Sodium. Posted in Grilling, Lamb, on January 7th, 2013. What a special treat – loin lamb chops grilled and served with a sauce (dried tart cherries, rosemary, dry Marsala wine, shallots and butter). All of it delish. Visiting Costco recently I noticed a gorgeous package of 7 lamb chops. Little things, beautifully trimmed, ready for the grill. The recipe came from the New York Times, but I’d read about it in my favorite cookbook, The Essential New York Times Cookbook: Classic Recipes for a New Century , by Amanda Hesser. This is her recipe that was published in 2001. A winner. It took a few minutes to make the sauce, and my DH did the chops on the outdoor grill. The sauce has a bunch of ingredients, but it wasn’t difficult – chopped shallot, garlic, fresh rosemary, some chicken broth, the dry Marsala, salt and pepper, plus some unsalted butter and oil. Have all the remainder of your dinner all ready to go so when the chops are done and the sauce is thickened just so, you’re all ready to serve it! What’s good: the meat was delicious – tender and juicy – and the sauce was unusual (from the tart cherries) but complemented the meat perfectly. It would make a lovely company meal. 1. Place dried cherries in a small bowl and cover with boiling water. Let rest for 15 minutes, then drain. Pat lamb chops dry with paper towel and season with salt and pepper. Heat a large skillet over medium-high flame. Add oil and sauté chops for 3 to 4 minutes per side for medium rare, swirling pan occasionally to make sure chops stay in contact with oil. Transfer chops to plate and tent with foil. 2. Turn off flame under skillet. Wipe with paper towel (lightly and carefully, so you don’t burn yourself—it doesn’t need to be oil-free) and return to medium heat. Melt butter in pan and sauté shallots until just tender, about 3 minutes, stirring occasionally to avoid burning. Add garlic and rosemary to skillet and cook, stirring, until fragrant, about 45 seconds. Add broth and Marsala to skillet. Stir in cherries and scrape up any browned bits. Cook for 2 to 3 minutes, until sauce is slightly reduced and thickened. 3. Divide lamb chops between two plates. Spoon sauce and cherries over and around chops. Serve. Per Serving: 832 Calories; 64g Fat (70.7% calories from fat); 35g Protein; 25g Carbohydrate; 1g Dietary Fiber; 156mg Cholesterol; 125mg Sodium. Posted in Lamb, on November 18th, 2012. Sometimes when lamb is cooking, it isn’t very appealing to me. The smell. I suppose that’s the part that’s almost like mutton. It must be the fat, which has a distinct taste. So I decided I’d make this in the pressure cooker. That way I wouldn’t have to hover over it so much or smell it all that long, either. I’d found a recipe over at www.food.com, and it was really quite easy. The lamb shanks were well-browned in a skillet first (at least that’s how I did it) in a bit of grapeseed oil. A whole bunch of whole garlic cloves were added later and sizzled just until they were light golden brown. Into the pot went chicken broth, Madeira (the original recipe called for Port, but I didn’t have any), dried rosemary, a bit of tomato paste, salt and pepper. Then the lamb shanks. That’s it. It rattled away for 35 minutes while I did other things. I made a green salad and some steamed broccoli and cauliflower too. Once the meat was cooked, and the pressure released, I removed the shanks and to the small amount of liquid in the pot (which contained a lot of fat, I’m certain) I added a bit of fig balsamic vinegar. Probably plain balsamic would work too, but I thought a fruity balsamic would enhance the flavor a bit more. With the left overs I poured the sauce into a container, expecting I’d be able to remove the fat. There wasn’t any. I suppose that means the sauce was kind of homogenized, so it didn’t separate. 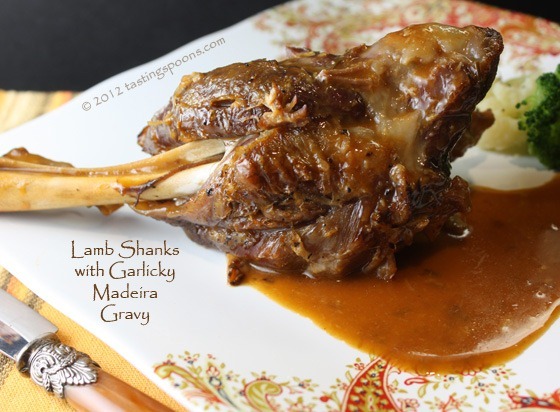 Serve this on heated plates and drizzle the gravy on top and let it pool around the shank. You might want some bread too, to soak up any of that very tasty, garlicky, boozy gravy. Just sayin’. What’s good: how easy it was to make – the pressure cooker just got dinner on the table in a bit less than an hour. The meat was tasty and meltingly tender. The gravy made itself, really – I didn’t have to reduce it at all – I merely added the balsamic vinegar and it was done. Easy meal beginning to end. What’s not: if you watch calories and fat, well, you may want to give this one a miss. I was astounded at the statistics in this dish, although I’ll say in my own defense, there probably isn’t more than about a heaping 1/4 cup of meat on a lamb shank. Well, at least the ones we had were quite stingy with the meat. But that made each bite worth savoring. NOTES: You could easily cook this on the stove top – for about 2 1/2 hours, covered, adding more liquid as needed. Don’t allow pan to dry out. The fat didn’t separate when I made this – perhaps the mashed garlic and tomato paste allowed it to homogenize. 1. Trim excess fat from the lamb shanks and season with salt and pepper. 2. Heat the oil in the pressure cooker. Add the shanks and brown on all sides. (I did this in a wide nonstick skillet). 3. When the shanks are completely browned, remove to a plate and set aside. Add the garlic cloves and stir quickly until they are lightly browned but not burned. 4. To the pressure cooker add the stock, Madeira, tomato paste, and rosemary, stirring so the tomato paste dissolves. Add lamb shanks. 5. Close the pressure cooker and bring up to full pressure (15 pounds). 6. Reduce heat to stabilize pressure and cook for 35 minutes. 7. Remove from heat and let pressure release naturally. 8. Remove the lamb shanks, set aside and cover loosely with foil. 9. If you have a gravy separator (and have the time) allow gravy to sit for 10 minutes so you can drain off the tasty gravy without all the fat. If liquid is more than about 1/2 cup, simmer at a low boil until the mixture has reduced and slightly thickens. 10. Add balsamic vinegar, stir, then mash the garlic cloves with a spoon. 11. Serve the sauce over the lamb. If desired, sprinkle the top with some grated orange peel. Per Serving (these numbers astound me – it must assume there was a lot more meat on the shanks than we had – or maybe there is something wrong with the numbers – I’m glad I only ate a few bites of it! ): 1071 Calories; 68g Fat (62.0% calories from fat); 86g Protein; 8g Carbohydrate; 1g Dietary Fiber; 299mg Cholesterol; 947mg Sodium.